The Smart Board and Computers Make Learning Fun at ABC! 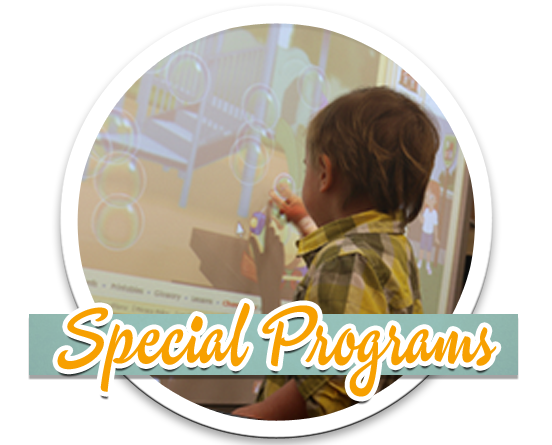 Smart Board is a colorful, interactive, electronic board that allows children to be hands on in the learning process with larger than life experiences. ABC offers Smart Board computer classes weekly at no additional cost. Children learn either audible, visual or by touch, and the Smart Board accommodates all of these learning styles. Our smart board is connected to our computer so that sitting in front of a computer now becomes a visual interactive experience. Hands-on with ipads and Tablets Handheld devices also allow for students to put the power of learning into the palm of their hands, through specially designed apps that focus on reading, writing and math skills. Weekly Spanish Lessons All children ages two through preschool receive weekly Spanish lessons. Classes are instructed by ABC’s fluent speaking Spanish teacher at no additional cost to the parents. Studies show that children absorb the most in the early years. Starting Spanish at age two, at the “window of opportunity” makes the learning process much easier for the children and provides them with a solid foundation for the future. According to studies, children who learn a second language in the early years score higher on the SAT test and go on to have greater opportunities for college and careers. Computers make learning fun at ABC, our colorful, interactive, electronic Smart Board allows children to be hands with larger than life learning experiences. Starting Spanish at age two, at the “window of opportunity” makes the learning process much easier for the children and provides them with a solid foundation for the future. ABC Special Events: You never know what kind of fun is in store! Visits from local heroes, tasty treats and unique games!